"Clothesline" 2012. Series 1. Made from crepe paper, scrapbooking paper, lace, thread, tiny pegs & string. Dresses approx 7" high. Shown on a railway sleeper. Private Collection. 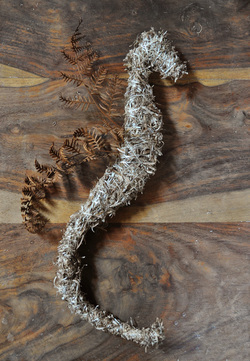 Made with dried sea grass, dried bracken and bound with cotton string.